I bought this bag at the Lyndhurst Craft Fair in September. 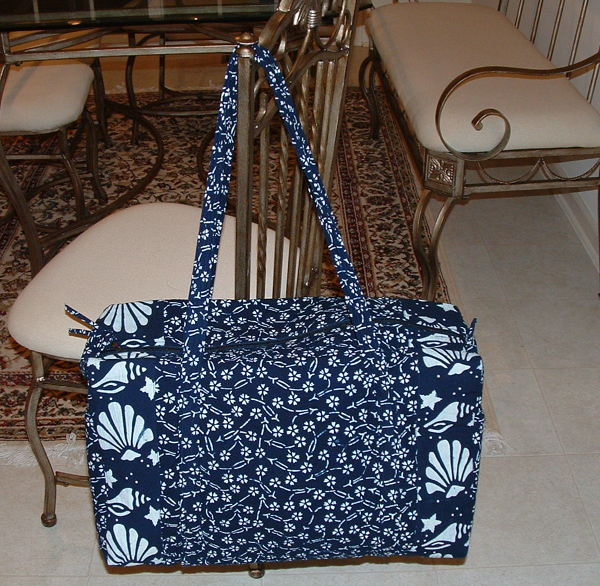 I just fell in love with the fabric and thought it would be a great bag for an overnight trip. It sat in my closet till this month. I was flying to Hilton Head, SC for a tennis vacation and decided to use this bag as my carry-on on the plane. It was great. I was able to fit so many things in it........eyeglasses, books, magazines, my i-pod, camera, binoculars, etc. It fit perfectly under the seat in front of me. I then also used it to go to the beach. It is roomy without being bulky and very lightweight. I carried it around everywhere and am now so happy that I decided to splurge and buy it. It has become my very favorite bag. You will not be disappointed. I am now going to buy some fabric to make a couple of those tunic tops that are so popular now.